How New Zealand is your tea? That is the question that the good people at Twinings want tea-loving Kiwis to ask themselves. Are we infusing our leaves in teabags made from the worn sweat socks of fleet-footed All Blacks? Do we stir manuka honey into our morning beverages using a kiwi feather or spoon fashioned from pohutakawa bark? If not, help is at hand. Twinings have created a more convenient way to get more New Zealand in your cuppa. I, unlike certain TVNZ presenters, am not one to cast racist aspersions on the New Zealandiness of other teas. I believe that this is a country that can and should embrace teas of all blends and backgrounds. Are we not all the richer for celebrating the diversity of the many types of tea that go into the New Zealand melting tea-pot? Still, given the historical symbolism of the tea leaf from the Boston Tea Party to the East India Trading Company, it’s easy to see how tea’s previous associations with imperial colonialism may help boost the marketing potential of a more patriotic brand of tea. 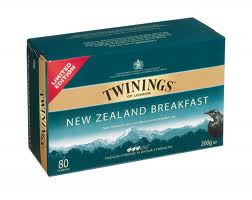 How nice that a local company with no ties whatsoever to England saw the potential profits in providing a New Zealand label alternative to English Breakfast Tea. Inspired by the magic of birdsong in the bush, as day breaks over the land, this delicious tea has been specially created to get New Zealand off to a great start every morning*. New Zealand Breakfast Tea is a full-bodied and satisfying blend, with generous, malty flavours. You will taste smokiness, reminiscent of campfires and billies coming to the boil, offset by subtle floral notes. This is a truly unique blend, unlike any other in the world. Of course, the proof of the tea is in the tasting and I’m happy to announce that New Zealand Breakfast Tea is rather delicious. Not that I’m a particularly fussy tea connoisseur. In fact my tea palate is so unrefined that I could not detect any flavour reminiscent of campfires or billies coming to the boil. Frankly, that was something of a relief and I have only had billy tea once in my life, and I found it to be horribly bitter and unpleasant. I also didn’t taste anything particularly breakfasty about the tea. Hopefully I shall not be attacked by flocks of tui and kereru if I partake of a cup in the afternoon for some egregious breech in New Zealand tea drinking etiquette. *It’s a limited edition so presumably at some stage in the future, it’ll be left up to us to get New Zealand off to a great start every morning on our own. Crikey. I have never drank New Zealand tea. It's something I should try some time. I wonder what Mexican or Canadian tea tastes like? They'd probably add cranberries and peppermint or something...or a combination of the two. Clarissa - I like the idea of adding cranberry and peppermint to tea (although probably not both together). I've had hot choclate that claimed to be Mexican. It had chilli in it and was incredibly delicious. I also imagined that Canadian tea would have maple in it but that may be an unfair assumption based on the tendency of some Canadian friends to wear a lot of clothing with the maple-leaf emblem and have yummy maple chocolates. That chocolate tea did not last long in my house. I'm impressed yours is still around. Such restraint! Matt - Yeah, nah, yeah. It's probably 'cos your such a good old kiwi bloke, mate, eh? You don't like that stuck-up posh tea, mate. Just give a bloke like you a decent cuppa of gumboot served in a hollowed-out Tui beer can and she'll be right, eh mate?